Entrepreneur and artist David Brown commissioned Henry Sargent to paint The Tea Party following his successful public display of Sargent’s The Dinner Party [19.13], hoping this second interior would prove equally popular. 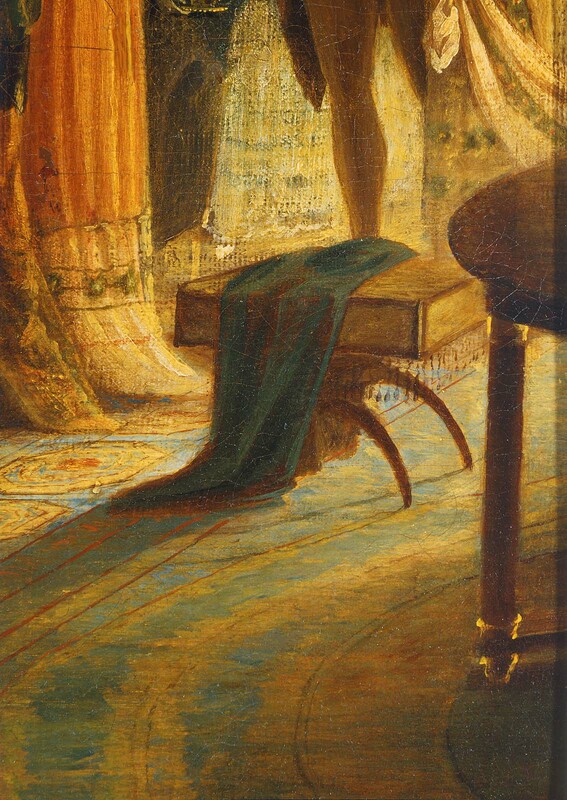 The Tea Party was first shown (together with the earlier dinner scene) in Boston around May 1824 and over the next decade Brown toured the pair of canvases repeatedly, bringing them to New York, Philadelphia, and Montreal. 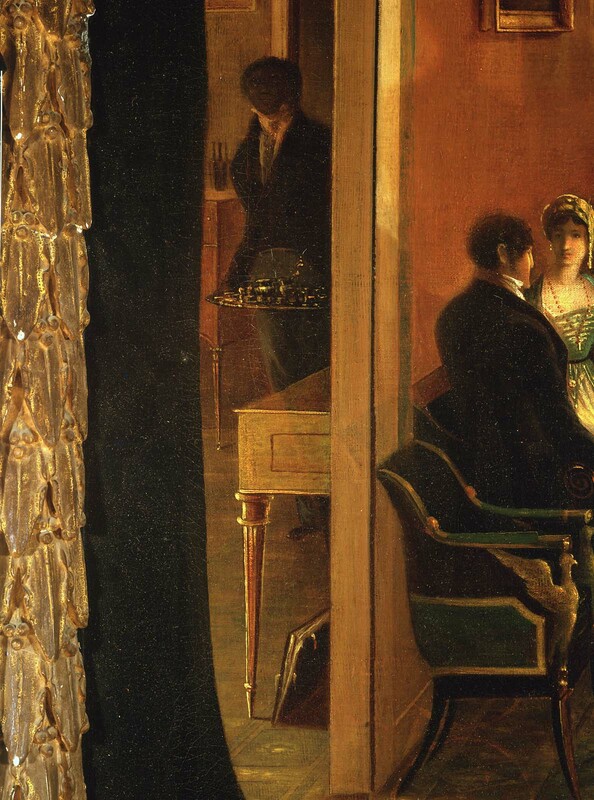 The casual deportment of mixed company in The Tea Party makes this composition an appropriate pendant to the more formal arrangement of The Dinner Party. Like The Dinner Party, The Tea Party may represent Sargent’s own home in the Tontine Crescent, a row of handsome Boston townhouses (no longer extant) designed and built by Charles Bulfinch in 1793–94. 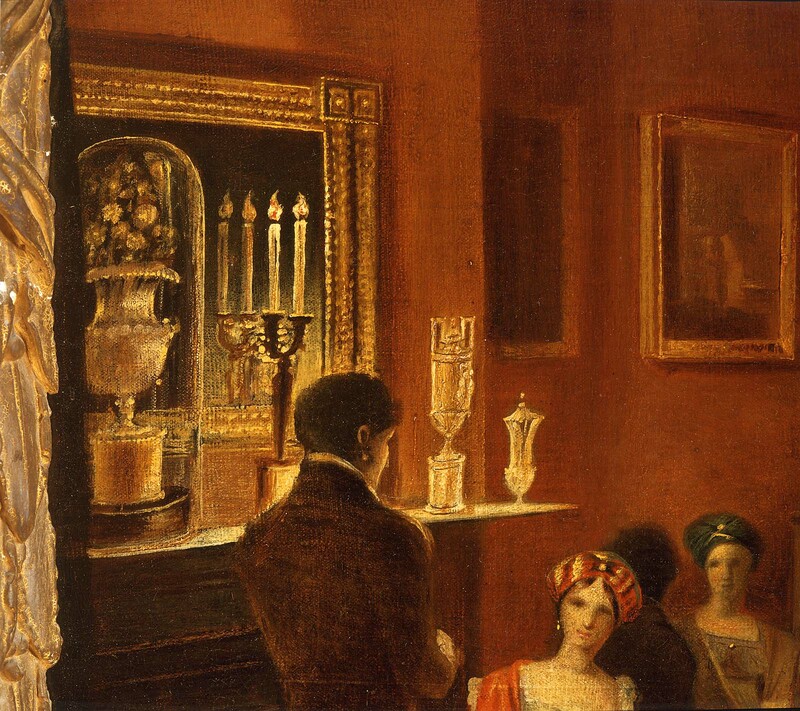 One contemporary critic noted: “The rooms and furniture [are] delightfully painted, and with the most minute fidelity.”  This is an upper-class interior, with two richly appointed parlors filled with fashionably attired figures. 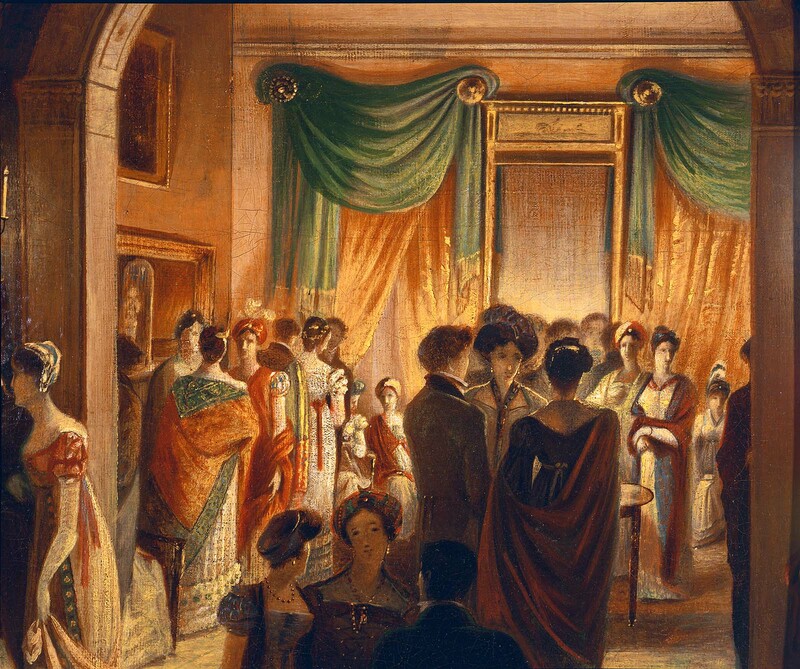 The women wear stylish Empire gowns in colors suitable for daytime; white garments were reserved for evening, as they were difficult to keep pristine. 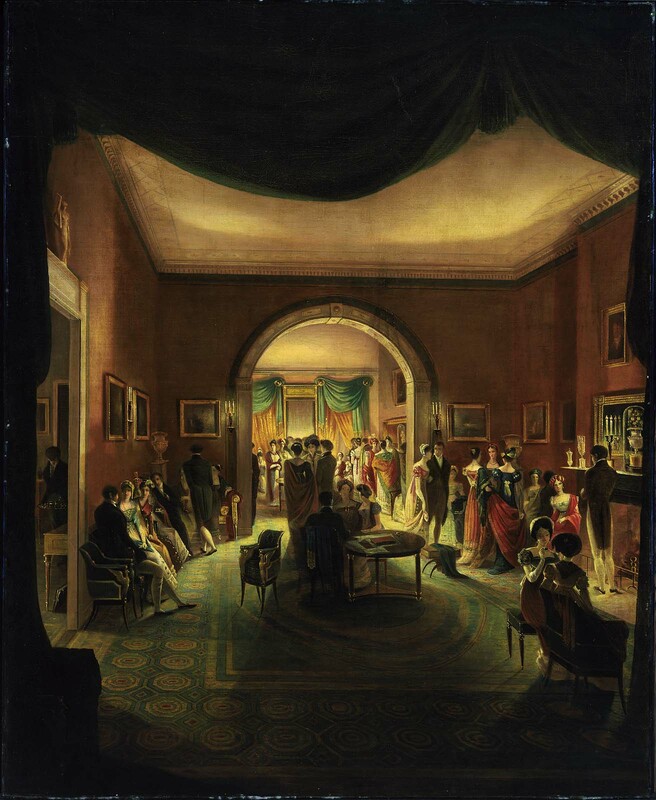 The furnishings reflect the latest styles recommended by such tastemakers as English designer Thomas Sheraton, who advised that the drawing room was to include the finest furniture and decorations in the house. 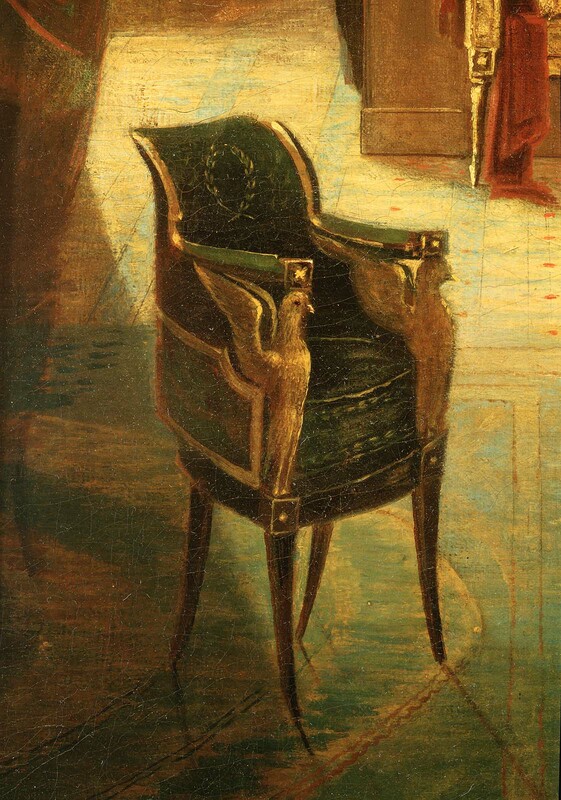 Sargent carefully delineated the French-styled Empire armchairs and a marble-topped center table toward the middle of the first parlor; the table may be one that descended in the Sargent family and is now in the collection of the Walters Art Gallery in Baltimore. 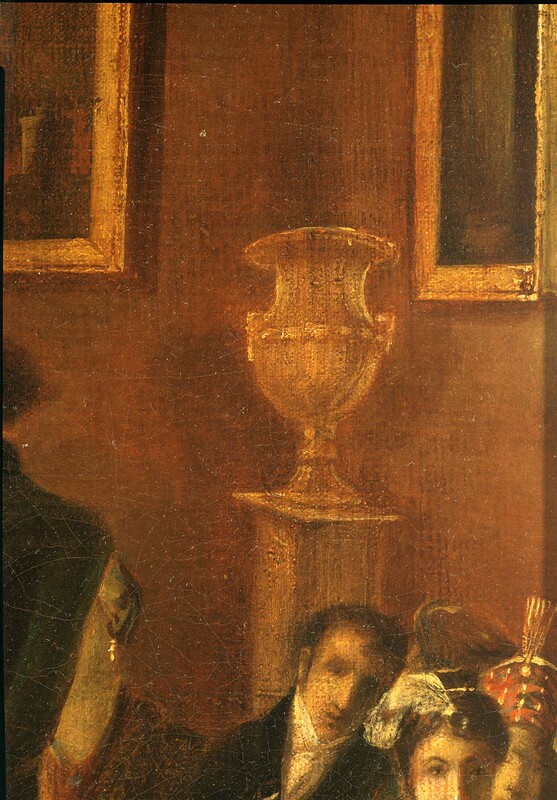 Other imported and domestic goods are displayed around the two rooms, including an alabaster vase on a stand in the corner at the left, mirrors that help to reflect the warm artificial light in both spaces, and vases and urns on the mantelpiece. The walls of the room are lined with paintings—likely some landscapes, a subject that Americans were just beginning to collect. Both The Tea Party and The Dinner Party were reacquired by the artist from Brown before 1842, when Sargent displayed one of them in the first exhibition to be held at Chester Harding’s Boston gallery. The two paintings remained in the Sargent family after the artist’s death and were given to the MFA in 1919. 1. Editorial, Columbian Centinel, May 8, 1824, quoted in Jane C. Nylander, “Henry Sargent’s Dinner Party and Tea Party,” Magazine Antiques, May 1982, 1176. 2. Nylander, “Henry Sargent’s Dinner Party and Tea Party,” 1180.